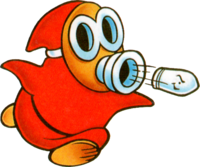 Snifits are Shy Guys with an extended nozzle for a mouth on their mask, which along with the dark coloration causes it to resemble a gas mask. Through their protrusion, they can fire projectiles - the most common being bullets made from nightmares. Though Snifits first originated in Yume Kōjō: Doki Doki Panic, they have since become somewhat frequent enemies in the Mario franchise. Snifits usually wear red robes, but they have also worn gray, green, blue, black, purple, pink, and yellow. 1.2 The Super Mario Bros. Super Show! A red-robed Snifit from Super Mario Advance. In Super Mario Bros. 2, Snifits (shown here to be affiliated with the 8 bits) are less common than their Shyguy relatives, and come in different colors. There is only one red Snifit, found in World 3-3; this trait is changed in many later appearances, where most Snifits are red. The red Snifit acts similar to a red Shyguy, walking off ledges it comes to, but occasionally firing. Pink Snifits are the most common, and act like the red ones except that they turn when they reach a ledge. Gray and green Snifits stand in place and occasionally jump while firing. The identical behavior of the gray and green Snifits is due to the fact that they are actually the same coded object, with the color variation being due to their palette having different colors assigned to it in different areas to affect other objects. This in turn is due to the NES's technology only allowing four palettes at a time on that graphic layer, with the fourth being the player character's. Another side effect of the NES's graphic technology is the Snifits' hoods appearing to lack part of their outline in the back in one frame and appearing non-pointed in the other, as the mouthpiece takes up extra space in the 16x16 pixel tiles. In the Super Mario All-Stars and Game Boy Advance versions, the pink Snifits are blue and the green ones are gray, the latter of which is due to the green and gray objects no longer needing to share a palette. Unlike Shyguys in these versions, Snifits all wear tan shoes in-game, though due to the shading on their mouthpieces, this may be intended to be a shaded white, like in the original. They also have a lighter outline on their robes than Shyguys, at the cost of having less shading on them. Ordinary Snifits do not appear in Super Mario 64 or Super Mario 64 DS; however, a floating species known as Snufits appear, which are analogous to Boo Guys. Several Snifits from The Super Mario Bros. Super Show!. Blue Snifits from the episode "Mario and Joliet". 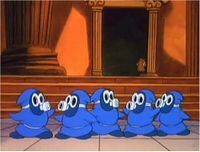 Snifits make several appearances in The Super Mario Bros. Super Show!, where they are most often portrayed as the minions of King Koopa and as shock troops of the Koopa Pack. 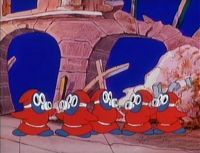 In some of their appearances in The Super Mario Bros. Super Show!, such as in "The Unzappables", Snifits were used in a manner similar to handheld machine guns. In the episode "On Her Majesty's Sewer Service", a Snifit shot Bullet Bill-like projectiles towards the Mario brothers. Snifits are featured in several issues of Nintendo Comics System, where they appeared to be high-ranking minions of Bowser, as they are shown to command and train his Shy Guy troops. One particular unnamed Snifit is featured prominently in the Nintendo Comics System issue "Duh Stoopid Bomb! ", where the Snifit, after accidentally becoming super-intelligent after being caught in the explosion of a Smart Bomb, usurps Bowser of his armies. In Nintendo Power's Super Mario Adventures comic serial, a Snifit can be seen among the attendees to Bowser's forced wedding to Princess Toadstool. 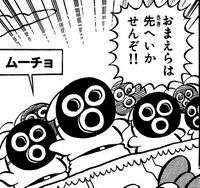 An army of Snifits have appear in volume 8 of Super Mario-Kun. They attack Mario, Luigi, and Yoshi, but Mario catches them off guard by dressing as Chef Mario from Yoshi's Cookie and then using assets from the game. Snifits are uncommon enemies found in some of Super Mario World 2: Yoshi's Island's various castle levels, where they attack Yoshi and Baby Mario by shooting projectiles at them. The projectiles in this game are oval, instead of circular and can go through walls. In this game, Snifits walk around and sometimes change their direction towards Yoshi. Yoshi can defeat a Snifit by jumping on it, eating it, or by simply shooting it with an egg. In this game, Snifits are noticeably larger than regular Shy-Guys, and all wear salmon pink robes. Normal Snifits do not appear in Yoshi Touch & Go, being replaced by Propeller Mūchos that are based on Fly Guys. In Yoshi's Island DS, Snifits do not appear, but a species derivative of Snifits called Scorchits appear. These enemies blow fires out of their mouths which can melt ice. Snifits appear in Yoshi's New Island as enemies. They are now roughly the same size as regular Shy Guys. They first appear in Heads Up, Hop Up, where they shoot in one spot without moving. A simple stomp or eating them can defeat them. Snifits return in Yoshi's Woolly World shooting hexagonal nuts at Yoshi. They can be defeated in the same way as previous games. The derived species of Ice Snifits also appear on snow/ice levels. The boss of World 5 is a large Snifit, named Snifberg the Unfeeling. 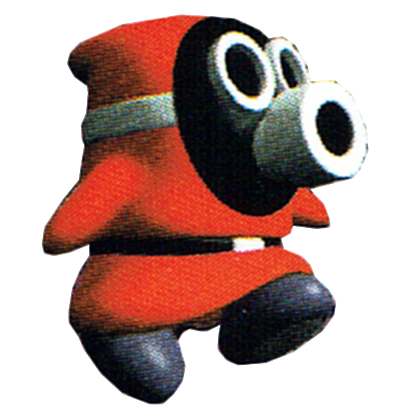 In Super Mario RPG: Legend of the Seven Stars, three dark-robed Snifits (aptly named Snifit 1, Snifit 2 and Snifit 3; Japanese name: ブッカー Bukkā, a play on Booster's name and 部下 Buka, subordinate) appear as the minions and playpals of Booster. Snifits 1, 2, and 3 first meet Mario after he defeats Punchinello in Moleville, where they are hunting beetles for Booster. While hunting these beetles, Snifits 1, 2 and 3 accidentally reveal to Mario that "a princess from the sky" is being imprisoned in Booster Tower. Blue Snifits appear as enemies in Booster Pass and Booster Tower. They are renamed Spookums in the English localization, but their Japanese name is the same as the leading Snifits. They overall have slightly weaker stats, but yield slightly better rewards upon defeat. Some of these blue Snifits, known as Apprentices, train on a hidden obstacle course at Booster Pass. Apprentices can be promoted to Snifits 4, 5, 6, and 7 if Mario and his team are defeated by them (which does not lead to a Game Over). All Snifits shoot Bullet Bills instead of shooting their traditional bullets. Later, in Booster Tower, Mario, Mallow, Geno, and Bowser can battle Snifits 1, 2 and 3. After entering Booster's playroom, Mario needs to try and hide from Snifits 1, 2 and 3 behind curtains as the trio of Snifits search for Booster's lost Mario Doll. If Mario is found behind these curtains too many times by Snifits 1, 2 and 3, he is forced to battle Snifits 1, 2 and 3 and Booster. If he remains hidden, Booster joins in and finds his Mario Doll; because it's too high for him, Mario knocks it down and Booster rewards him with an Amulet. On Booster Hill, Snifits 1, 2, and 3 try to ram Mario as he races up the slope after Booster and Princess Toadstool. Mario could jump on the heads of Snifits 1, 2, and 3 to get a boost up Booster Hill. Finally, in Marrymore, after Booster barges into the Marrymore Chapel (interrupting the wedding of Raz and Raini) Snifits 1, 2 and 3 act as guards, making sure no one interrupts Booster's forced wedding to Princess Toadstool. After breaking into Marrymore Chapel, Snifits 1, 2, and 3, after learning that Princess Toadstool has lost her accessories, begin to search for them and relies on Mario to bring the accessories they had found to Princess Toadstool. During the battle against Raspberry, Snifits 1, 2, and 3 and Booster appear; it was Snifits 1, 2 and 3 who inadvertently destroyed Raspberry for Mario, after the trio convinced Booster to devour the cake. An ordinary Snifit can later be seen in Seaside Town, acting as the manager of “Beetles Are Us”. Several dozen Snifits also make a small cameo in the ending cinematic of Super Mario RPG: Legend of the Seven Stars, with the entire audience of Booster's wedding to Valentina being composed of them. Snifits are among the few enemies that can be permanently removed from the map; Booster's Snifits can no longer be challenged after Booster Tower is cleared, Spookums disappear forever if they are defeated, and there are no more Apprentices at Booster Pass after the eighth one. A Snifit appears in Space Land of Mario Party 2 as the only known member of the Snifit Patrol. Paying a few coins will set a speed trap, which will cause any player who lands on a happening space in that board go farther down the green-lit pathways scattered across the map. A Snifit in Mario Party 3. Snifits appear in Mario Party 3 as the starting partner of Princess Daisy in the game's Duel Mode. It has an attack power of 2, a stamina stat of 2, and a salary of 5 coins per turn. It sometimes finds 2-4 coins at the start of its player's turn, effectively reducing its salary. In Mario Party Advance a Snifit is found in Horror Condo. It lives on the second floor of the condo. A Purple Snifit (far left) from Mario Kart: Double Dash!!. Snifits make a few minor cameos in the Mario Kart games. In Mario Kart: Super Circuit they make a cameo appearance in the Sunset Wilds course, where they are viewed alongside other enemies on totem pole obstacles - the other enemies being Shy Guys and Toadies. Their next appearance in the series is Mario Kart: Double Dash! !, where they make another cameo as characters in the audience of Waluigi Stadium. However, they were removed from the course in Mario Kart Wii, due to using the same audience animation from the other courses. In the Mario & Luigi series, Snifit derivatives are common. Laser Snifits (actually Woohoo Hooniversity's transformed Beanish professors), Spiky Snifits, and Ice Snifits appear in Mario & Luigi: Superstar Saga. In Mario & Luigi: Partners in Time, a Snifit derivative called Snifaro appears in Gritzy Caves. Snifaro is a Snifit pharaoh in a sarcophagus that is standing atop an ordinary Snifit, which is revealed when they open it up to shoot bullets. If the player uses a Bros. Flower on one, the sarcophagus burns up, resulting in the Snifit fleeing and the Snifaro remaining to fight on its own. In Mario & Luigi: Bowser's Inside Story, Snifits only appear during enemy battles with a derivative species of flower-like Snifits called Flifits, and Flifits' younger form Sneeds. When Flifits lose their petals, a Flying Snifit appears to pour some water on them and heal them. Snifit toys appear in the Mario vs. Donkey Kong series. Their attack pattern consists of firing five bullets at a time, with each successive shot knocking them back, then moving back into place to resume their next charge. They appear in Mario vs. Donkey Kong 2: March of the Minis, Mario vs. Donkey Kong: Minis March Again!, and Mario vs. Donkey Kong: Mini-Land Mayhem! 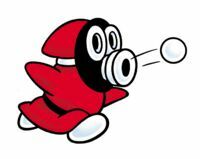 Mini Marios can stand on their head in the first game, while the same action will cause them to be destroyed in the latter two appearances. Snifits make their Paper Mario debut in Paper Mario: Sticker Star. Snifits are first present in World 3, where they are the most common enemy found, an optional foe, and they are under the direct command of Bowser. For example, one Snifit is seen in The Bafflewood. It can be seen walking back and forth. There is also one Snifit hiding in the bushes trying to make the player not notice it. Snifits can be encountered on land or in poisonous water, which they are implied to enjoy. Snifits also appear in Bowser's Snow Fort alongside Shy Guys. They can be found in the trash area of Shy Guy Jungle before the player uses the goat or vacuum Things. Mario may pull one out and battle it. A game show called Snifit or Whiffit is hosted by a Snifit who goes by said name. Mario must participate in this game in order to obtain a Wiggler Segment, which is necessary for progress. If Mario completes the three challenges, Snifit asks him to participate in another one, which combines the first two challenges. If Mario wins this final challenge, he is awarded with the Radiator Thing (Coins if he returns and has already collected the Radiator). In battle, Snifits have many attacks: they can either spit out one bullet at Mario or a barrage of three. If Mario uses a Tail sticker or any other sticker that includes a Spike Helmet, a Frog Suit or a Super Boot, the Snifits may attempt to push Mario much like the Clip Guy's and Paint Guy's attack when they try to clip or paint Mario. If successful, Mario loses the sticker. 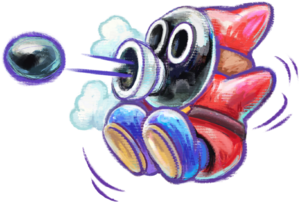 If Mario is able to attack multiple times via Battle Spinner, a Snifit may also knock away one of Mario's attacks. Snifits are mostly assisted by Ninjis, Clip Guys, Shy Guys, Piranha Plants, and Poison Bloopers, but they can also be assisted by Scuttlebugs and Goombas; some Snifits fight alone. In its artwork, they are wearing brown bandannas and dark red robes while in game they are wearing yellow bandannas and light red robes. Snifit hosting Snifit or Whiffit in Paper Mario: Color Splash. Snifits return in Paper Mario: Color Splash and share the same abilities as in Sticker Star. There is a yellow variant of them now, while the blue, green and pink variants are now the same as the Shy Guys' modern robe designs. In addition, the Snifit from Snifit or Whiffit returns and this time, Mario must play the game to earn a Mini Paint Star and the Instant Camera Thing card if he clears the bonus round. Variants of Snifits such as Slurp Snifits, Chariot Snifits, Whistle Snifits, and Spike Snifits appear in the game. Psychopath "Minimum wage for THIS?!" Quotes Usual: "You're jealous of my mask. Admit it." ~ "You're in spitting distance!" ~ "Noxious fumes are nothing to me!" ~ "Pew pew!" The Golden Coliseum if encountered in arena: "Is everyone looking at me?" ~ "Spitfire!" ~ "I'm fired up...ish." ~ "Are you bad to the bone?" Mustard Café: "Always follow the rules!" ~ "I could go for some coffee..." ~ "We must protect our territory!" ~ "Just stay calm..."
Quotes Usual: "Always follow the rules!" ~ "I could go for some coffee..." ~ "We must protect our territory!" ~ "Just stay calm..."
and chō (長, a military leader, referring to their rank). Spanish Olfiti From olfato (smell) and Snifit. Portuguese (NOE) Snifes From the English "sniff"
Super Mario Galaxy features a gigantic robot boss called Megaleg which has a similar face to that of a Snifit. As a consequence, Digga-Leg from Super Mario Galaxy 2 also resembles a Snifit. ↑ 「魔夢族の一員。お面をつけていて、口から悪夢の弾を撃ってくる。」 ("A member of the Mamu Family. They wear masks and spit the bullets of evil dreams from their mouth.") - Yume Kōjō: Doki Doki Panic instruction booklet, page 30 (ムーチョ赤). ↑ "A member of the “8 bits.” He wears a mask and spits the bullets of evil dreams from his mouth." - Super Mario Bros. 2 instruction booklet, page 23 (Snifit - Red description). ↑ From the ending scenes of Super Mario Advance as localized by iQue. Reference: 无敌阿尔宙斯 (August 28, 2013). 神游 超级马力欧2敌人官译 (Official names for iQue Super Mario 2 enemies). Baidu Tieba. Retrieved February 2, 2017. This page was last edited on April 23, 2019, at 08:42.